Missteps in business are costly—they drain time, energy, and money. Of course, business leaders never start a project with the intention to fail—whether it’s implementing a new program, launching a new technology, or trying a new marketing campaign. Yet, new ventures are at risk of floundering if not properly approached—that is, making evidence-based decisions rather than relying on intuition. What if there was a way to more reliably ensure that business risks weren’t as prone to failure? As we see in the example above, the solution lies in well-planned experimentation. If businesses can learn to identify concrete decisions needed to move new or existing projects forward, and set up experiments that directly inform those decisions, then much of the painful time, energy, and monetary costs of mistakes can be avoided. However, many business leaders and entrepreneurs are weary and unsure about how to leverage research to benefit their companies most effectively. Therefore, they rely (perhaps unknowingly) on riskier decision-making approaches. The better route? Rigorous experimentation. Asking well-formed research questions, designing tests with isolated variables and control groups, randomizing users to groups, and using data to inform business decisions. At the Center for Advanced Hindsight’s Startup Lab (our academic incubator for health and finance technologies), our mission is to equip startups with the tools to make business decisions firmly grounded in research. But the research process has to be more accessible to businesses. Entrepreneurs often come to us excited about research, but with little to no idea of what it takes to execute a rigorous experiment. There’s a lot of anguish, confusion, and hesitation about where to even begin. The Startup Lab makes experimentation more approachable to entrepreneurs who have the will, but often not the time and resources to run studies like our colleagues in academia. There are specific considerations that businesses take into account when wading into the world of research. An important one is what makes investing in experimentation worthwhile? 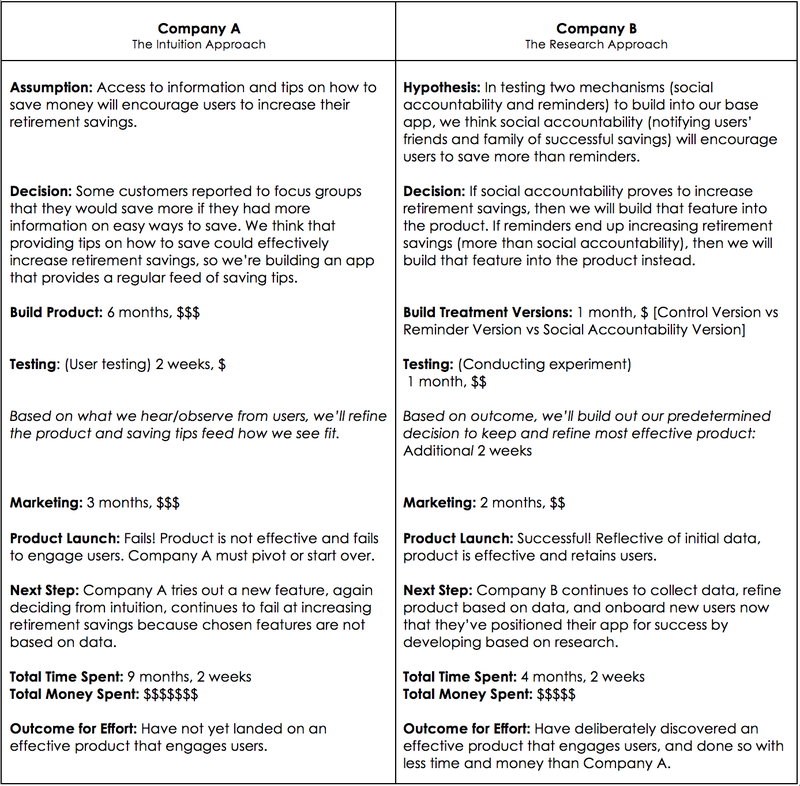 The driving purpose of running experiments, in most business contexts, is to uncover results that are clearly actionable. So how do you ensure actionable results? You set up your process with this goal in mind from the start – not as an afterthought. The Startup Lab adapts Alan R. Andreasen’s concept of “backward market research” to bring the process of planning and executing a research project to entrepreneurs. “Beginning at the end” means that you determine what decision you’ll make when you know the results of your research, first, and let that dictate what data you need to collect and what your results need to look like in order to make that decision. What business decision will you make based on what your research uncovers? The problem with the simple exploratory approach is that it sets you up for certain failure from the start. An unclear question produces an unclear answer. You’ll end up with data that you can’t possibly base a concrete decision on. But imagine that instead, like Company B, you plan a research project to collect data on your users’ saving behavior (instead of probing to reduce your ignorance on their stated savings challenges). 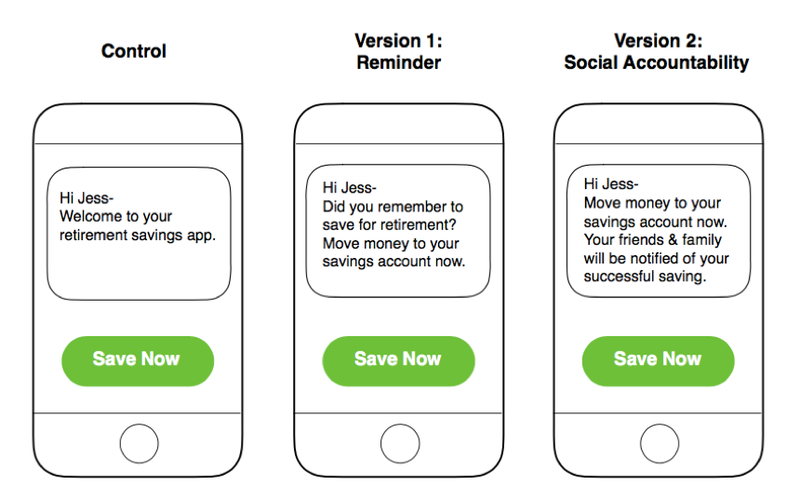 You set up an experiment to test two different ways of encouraging users to save (your two treatment groups, reminders and social accountability) against the current version of your product (what we call a control group). Now you’ve set up an experiment, but you can’t stop at designing your research. The “backward market research” approach forces you to specify which decisions you will make based on the outcome. If the social accountability version leads your users to save twice as much as they do when using your base product, will you implement this mechanism in your product strategy? How will you do so, and what might the implications be? Once you determine 1.) The decision you will make from every possible outcome of your research results and 2.) How each decision will be implemented, then your research is set up to lead to actionable insights that have the power to move your business forward. P.S. You too can design and conduct experiments using the ‘backward market research’ method. Use our handy tool to guide you through the backward approach: ‘Beginning at the End’ Worksheet. And remember, to orient your research toward actionable decisions, start with the end in mind. Andreasen, A. R. (1985). ‘Backward’Market Research. Harvard Business Review, 63(3), 176-182. At the Center for Advanced Hindsight’s Startup Lab, our academic incubator for health and finance tech solutions, we aim to instill a commitment to research-backed business decisions in the companies we bring into our fold. We will be releasing more articles and tools like this as part of our Experimenting in Business Series on our blog. Leveraging research for smart business decisions is a powerful skill—we’re aiming to make rigorous experimenting less intimidating and more accessible to a broad range of businesses. By the way—we’re also accepting applications for the Startup Lab’s upcoming program, which starts in October. We’re looking for startups that are eager to experiment, and demonstrate a passion for building research-backed solutions to health and finance challenges.